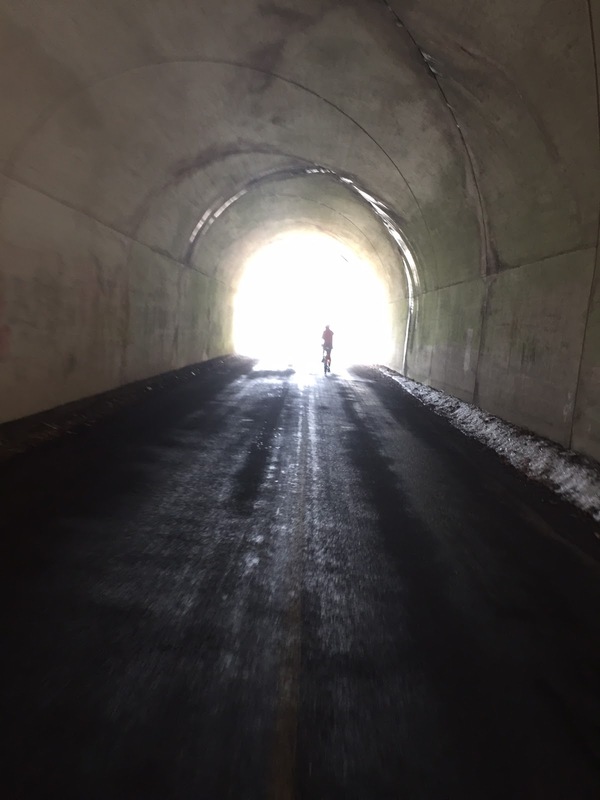 With the snow from the recent blizzard completely melted off the roadways, mostly dry conditions, and manageable temperatures, it was a great day for an early Spring brevet. 28 riders clipped in at the Weisel Hostel (aka The PA Rando Clubhouse) and all 28 riders made it around the challenging course before the time limit, for a 100% success rate. Congratulations to all, and well done for that excellent result, to start the Eastern PA spring series. There were some reports of isolated rain sprinkles, and some cold temperatures early on, but we were lucky to have such a good day, especially given how rough things were in early March. The 100% finish was not obtained without some drama. As riders came in, the word passed along was that Aleksey V. had encountered a mechanical issue with his bottom bracket. Later on there were reports that Aleksey had called a cab and we rashly conjectured he had abandoned the brevet. But his observed activity had another interpretation. Aleksey called a cab for transportation to a nearby bike shop where he obtained what he needed to repair his bike. 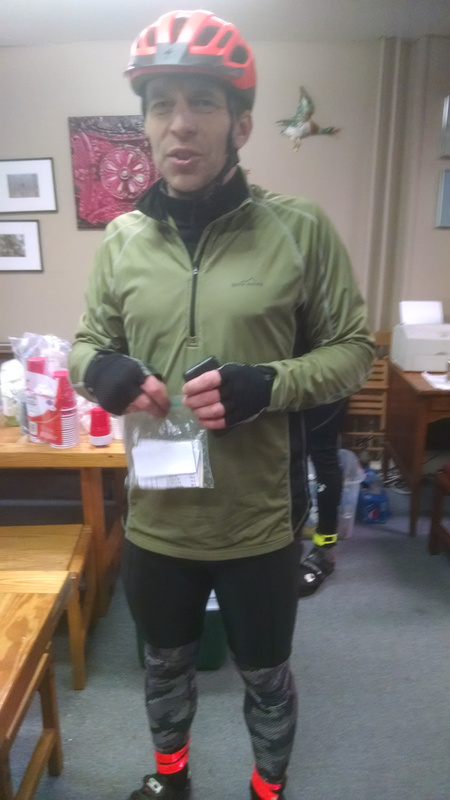 He then returned to the course and continued the brevet, finishing in good time. Certainly this resourcefulness nominates Aleksey for the PA Rando Never-Give-Up Award. Hurrah, hurrah Aleksey! Finish photos for most riders are here. My apologies to the few riders I missed. Special thanks to a superb crew of volunteers who made this event possible: Bill O. and Guy H. did final check-in and clean up; yours truly Chris N. did set-up and check in; but the PA Rando Hungry Cyclist Meal Total Awesomeness Award goes to Joe R. for preparing a postride meal of his scrumptious award winning chili. Mmmmm, mmm. Joe R, award-winning chili cook at the finish. CJ A writes: Thanks for the ride yesterday. Couldn't ask for better conditions to kick off the series... mild temperatures, a bit of sun, and even shifting winds to give us a tailwind all day! The course was in great shape with a lot of fresh pavement and extremely quiet roads; I'll chalk part of it to the earlier start time, which was much appreciated at the finish. It was fun to yo-yo throughout the day and actually see many others on the course, which is somewhat unusual for me. The challenge of finishing out the ride on a 2-speed was actually kind of fun, and I now have even more respect for those who voluntarily tackle these courses on single-speed / fixed-gear! Joe's chili was excellent, and very much looking forward to whatever he's cooking up for future rides. Ride to eat, and eat to ride. Jimmy A writes: I want to thank you and everyone else who helped put this ride on. It was a great day for a ride. The morning was unexpectedly cold, and I had to wear more layers than I initially thought I would be wearing. Luckily for me, temperatures remained relatively low for most of the day, so I didn't overheat. I rode the whole day with Gavin, Matt, and Bill F., and we enjoyed mostly dry conditions. Some roads had recently seen rain, but the most we ever rode in was a light drizzle. I'm sure we'll get a warm and sunny day soon enough. I think scenically, my favorite view of the ride is at the top of the climb on River Rd before crossing the river into Belvidere. The view of the Delaware from the top is unparalleled, and I always enjoy it. Seeing and riding underneath the Paulinskill Viaduct is always pretty cool too. It was awesome to see such a good showing at the start of the ride today, and I hope everyone had a great ride. I am looking forward to the next one. 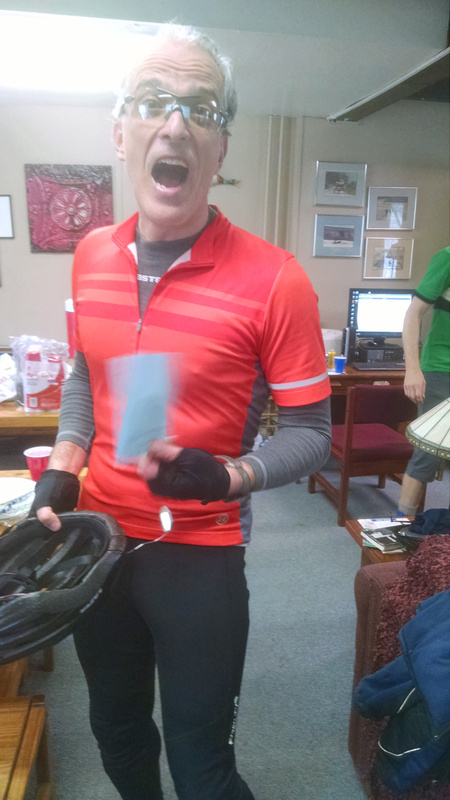 Joe R writes: Thanks to everyone who made such a terrific brevet possible yesterday. This is now one of my all-time favorite routes! Stony Garden without potholes is a big plus at the end of a 200k! A special treat at the finish was a visit by RBA emeritus Tom R.
Tom R says: I originally wasn't planning on dropping in, until I realized how much I missed the camaraderie of our rando-clubhouse. It was good seeing a couple of new faces, along with many regulars. And it's great to see the series still going strong. Ah, wanted to make sure my pictures didn't get missed! many thanks for the great event. I really enjoyed the scenic and reasonably challenging course, and I have never been to some of the roads. Looking forward to the next event. And kudos to Chris E. and Chris M. They rode really strong. I tried but there was no chance I could stay with them all the way to the finish line, even on a healthy bike. Right after the second control I started experience problems with shifting and chain getting dropped. Then I understood that the actual problem was with the crank that was not too solid. I had to stop just before Stewartsville. I called for a taxi and they drove me to Phillisburg. With a wrench from Autozone and quick help from a car shop nearby I got back onto the bike and rode to Genesis bike store in Easton. Genesis mechanic managed to put the stuff in right places and told me not to push on the left. I rode back onto the course (riding through Phillisburg was the worst experience of the day actually) and somehow managed to get back to the hostel working mostly with the right leg and walking a few spots in PA.
here is the picture of the left crank arm - you can see damaged teeth and hammer marks.